Dharamshala makes me happy, well as long as am away from hustle bustle of the busy market. My house is tucked away in a quiet place; standing behind are magnificent Dhauladhar ranges. Nearly every day I wake up to meditative sunrise and in evening watch sun quietly disappear from behind a bunch of trees swaying in the dusky sky; while cars, buses speed and people rush home after day’s work (presumingly tiring), unmindful to the nature they are bestowed with. The view effortlessly could inspire anybody to paint, write a poem or may be even sing a song; I chose to write. Its pleasing to find inspiration in unlikely places. I found it in kitchen garden’s here, something that is not prevalent in Kullu (our landlord here has one too). Strange as it is, I did not see any in the new sprung-up modern mansions; however they did have a lawn or a parking space instead. Winter is about to cease, the weather is warmer, the rays from sun enter your skin deep, relaxing cold stiff bones as if jammed rusted machine parts in need of lubricant. Around now, in just about every garden one can spot bright yellow specks dangling on an about 15 ft tree; the kind of yellow that reminds you of pleasant summer ahead, the one that makes you happy. Lemon Tree, the only one I could Spot! It was winter holidays, though boring at times-something we try not to admit. Those were the days of cable, land-line telephone, Mario and Disney hour at 5 pm. The days would be long with nothing much to do. One fine day, under clear blue sky, as we trudged by one of our neighbour’s garden, starved of adventure and fun, we spotted plenty of galgal; our eyes wider than that of a lemur’s now. But the neighbour happened to be a teacher in our school. Even so we were salivating as we looked at each other greedily; grinning with evil in our lemur eyes. The very next moment we were ready at our positions; one stayed outside the fence to guard our silly act, the bravest one crept inside from between the barbed wires while others waited for the signal. There were only hushes and sound of cricket now bouncing; disturbed by the steps of unwanted intruders. Once assured the house was locked; we all sneaked in, hastily picked as many lemons as we could and ran with all our mighty; laughing our lungs out! The lemons mixed well with a pinch of salt, sugar and ‘lal mirch’ were consumed quicker than they were picked. We had it in one platter, licked our fingers until the flesh had turned all new and fresh like that of a new born baby’s. A day well spent, those were my ‘lemony days’. On yet another boring day, we maneuvered the same act to grab our hands on the corns in nearby field. I was desperate to have my lemony days back, a slice of my cherished memories. Being new to the place, it did not seem appropriate to ask just anybody for lemons from their garden. My landlord had cut down their lemon tree for they were making space for a parking lot, I could only sigh. Someone told me they would soon be up for sale in local sabzi mandi at kachheri. I waited uneasily. And then unexpectedly we had to rush to kullu for an urgent work. I returned after a month, the lemons were gone. Seeing my disappointment, my husband inquired at his office to locals if they had any. Next day he came home with a smiling face “Galgal ka achaar”, he exclaimed. I was happy but not content. 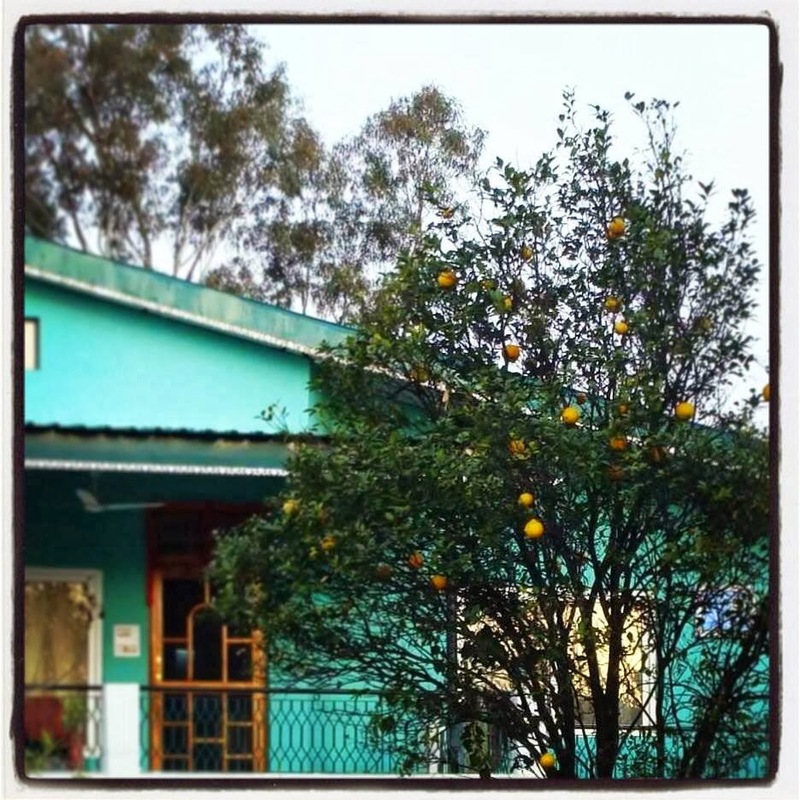 On later days, a few times I spotted lemons far off while traveling to nearby villages. “Next time definitely”, I said comforting myself while salivating greedily! Posted in Online, Published. Tagged Dharamshala, Dharamshala Diaries, GalGal, Himachal Pradesh, Kullu, Lemon.